• The motherboard is equipped with a processor 3510 Ali, memory 4MB flash EON, MB of DDR2 512 memory. • USB 2.0 connector with support for Wi-Fi USB adapter. • Supports TV picture resolution up to: 1080i-50Hz, 1080i-60Hz, 1080P-50Hz, 1080P-60 Hz . • Support satellite standard: DVB-S/DVB-S2 (MPEG-2/MPEG-4/H.264) . • Emergency receiver's firmware via RS-232. • Supports DiSEqC 1.0/1.1/1.2/1.3 (USALS), Auto DiSEqC. • Sorting, Moving and editing channels simultaneously on several parameters. 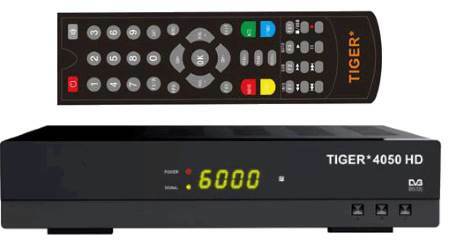 The front panel of the receiver TIGER 4050HD has a standard set of 3 control buttons - POWER, CH +, CH- . - The power indicator LED as . - USB 2.0, to connect a USB flash drive. Can be used to connect WiFI adapter Ralink 5370 chipset USB WiFi, firmware updates and settings receiver, playback of media files (jpg, bmp, gif, mp3, ogg, flac, wav, mpg, avi, 3gp, mkv, mp4, mov, ts, m2ts, dat, vob), video recording. - Switch ON/OFF, the power to issue 90-240 50/60 Hz receiver.